IHS Class of 1969 Facebook Group. 1969 alumni and friends have an active group on Facebook called "Ilion High School Class Of 1969 Reunion". 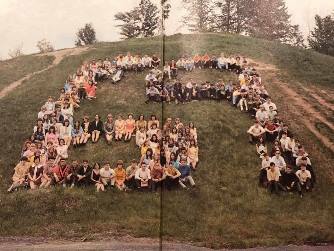 The class of 1969 is planning our 50 year reunion to be held at the Elks Club at 8 pm on Friday 7/19/19. "Hi members of the Class of 1969!! As everyone is undoubtedly aware it has been almost 50 years since we all left good old Ilion High. We have gone in many directions but we will always share a common bond with the village, the teachers, the school and each other. Let’s celebrate and reconnect with friends we may not have seen in a long time. Plans are being made for a 50th class reunion to be held on Friday July 19th- to be followed by what is being called a mini mega class reunion for the classes of 1963-1973 to be held the next day. Details to follow. Please pass the word to any and all classmates you know - the bigger the turnout the more fun we will all have. This page is not only to keep everyone updated on the activities of the reunion but also to share with each other memories, photos, information on classmates and friends, and anything else of interest to the class. As plans develop we will pass them on- it should be a wonderful weekend!! We can’t wait to hear from you!!! The Facebook Event Class of '65 70th Birthday Party, can be found on the Facebook page. Friday July 21 - Those who would like, we will be gathering on the Elks Lawn around 5 pm, the Doo Dah parade starts at 6 pm. Many other classmates, from other classes, always hang around there, so we should get to see many others. Bring lawn chairs if you like, but they do have some picnic tables set up and have food and drinks to purchase. Below is a compilation of classes actively using facebook for communicating with classmates. Links will open in new browser windows. You may not find all your classmates when you are organizing reunions because not all classmates have facebook login ids. Please do not soley rely on facebook to publish reunion invitations because you may miss contacting ALL class members. *** SUGGESTION *** - If your class is going to use facebook to coordinate and publish reunion information, consider creating a Class Reunion PAGE (not group) and set the security restrictions so that it is visible to the public and has no age restrictions. Facebook Pages are visible to everyone on the internet by default. This approach will allow you to reach all your classmates, not just those that are registered facebook users. Even public facing Facebook Groups are only accessible to any alumnus who does have a Facebook Account. 1992 Public - Page Ilion High School Class of 1992 Michelle A.
Facebook Page - Only the official representative of an organization, business, celebrity, or band may create a facebook page. The Page creator can then add other representatives to help them manage the Page. Each Page admin will be able to update and edit their Pages from their own accounts. Community pages are built around topics, causes or experiences. Many community pages display Wikipedia articles about the topics they represent, as well as related posts from other people on Facebook in real time. Official Pages are maintained by authorized representatives of a business, brand, celebrity, or organization, and they can create and share content about the entities that they represent. Non-facebook users can see the page if its security is set to public with no age restrictions. Groups allow you to communicate directly with other people on Facebook about a specific subject. Anyone can create and admin a group. Requires that a visitor be logged in to facebook to see the group. Open: Anyone on Facebook can see the group and join. That means the group will appear in search results and all content that members post (ex: photos, videos and files) is visible to anyone viewing the group. Closed: Anyone on Facebook can see the group name and members, but only group members can see posts in the group. Unless you're added to the group by another member, you'll need to ask to join. You'll become a member when your request is approved. Secret: These groups cannot be found in searches, and non-members can't see anything about the group, including its name and member list. The name of the group will not display on the profiles (timelines) of members. To join a secret group, you need to be added by a member of the group. Kelly Richards Rowland is the Facebook Admin for a closed Facebook group named IHS Class Of 1997 20 Year Reunion about the Class Reunion. Kelly wrote: "IHS Class of 1997 Reunion Update! We WILL be having our 20 year reunion. It looks as though we should have around 60 people. Thank you all for filling out the interest form so we knew if we should go ahead with plans." PS. Since our class was one that hung out with many others from other grades they are more than welcome to attend. However, they will also be charged. Hope to see some of those from 1996 & 1998! If you have questions, please contact Erin Bullis Dempsey, Kelly Morris Cave, or myself. Can't wait to see you all there. In addition, please share or text your friends! The more the merrier! Saturday 1:00 Doty's for golfers $20.covers cart and golf. 7:30ish to 10:30 or so Music etc. See full details and discussion on Public Facebook Group Ilion High School 40th Reunion, Class of 1977. Information about Class of 1967 reunion. On Friday, there is a plan for us to get together downstairs at the Elks Club at 7:30 or after the Doo-Dah parade for some refreshments and laughs. On Saturday morning at 11 AM a tour of the merged Central Valley Academy can be arranged if there is an interest. We will be able to see the growth and renovations that have taken place in the last 50 years. For Saturday Night, we have planned a "casual" dinner dance at the Waterfront Grille Terminal Building and Gazebo in Herkimer. This will feature a cocktail hour from 6 to 7 PM followed by a buffet dinner. There will be a cash bar. We will later be able to enjoy and reminisce to the music played by none other than the "Boss V". Saturday at the Waterfront Grille Terminal Building is $30 per person. We ask that reservations be made ahead of time and would like to have responses by July 1st. We may not be able to locate everyone. Please notify your friends from our class. Plans for the 10 year reunion are being organized by Gretchen Olson - ilionclassof06@gmail.com. Check www.eventbrite.com for details and tickets. The reunion will be held on Saturday, July 30 at 7pm at The Elk's Club in downtown Ilion. Tickets are $30 per person and include two drink tickets and heavy appetizers. We will have fun contests and games, as well as a DJ playing all the hits you remember hearing in the IHS gym. We hope you will join us! Get ready to board the Erie Canal Boat Tour for a fun filled evening with your classmates . . . 3 hour cruise with entertainment, food, cocktails plus an additional hour dockside. Time is TBD - more information to follow. We have had only a few letters returned but thanks to the internet we were able to track down those people. We cannot assume that all letters were indeed received by a classmate. We have not heard from many of you out there as to your decision to attend. So if you still have the response form and the envelope, I would greatly appreciate it if you could return it to me. The class will be holding a 42nd year reunion the weekend of August 1, 2015. Check the class Facebook Group for contact information. You will need a Facebook account to joint the group. Salads, Pasta Salad, Macaroni Salad, Fruit Salad, Snacks, like chips and dips or pepperoni / cheese / cracker plates or taco dip or ??? Lawn chairs, coolers and ice. This is a BYOB event. We'll have lawn games, a photo booth, and lots of space for parking. Look for our Class of 73 banner (with balloons) on Deb's fence! If anyone is available to help with setup on Friday or Saturday, please let us know!! 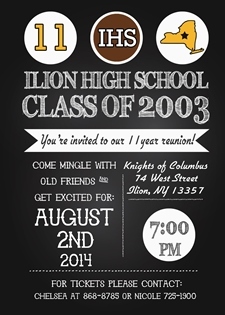 Please join us Saturday, July 19, 2015 to celebrate the 20th Reunion for the Ilion High School Class of 1995. Dinner, drinks and fun starting at 6 pm at the Ilion Moose Lodge. Please send checks to Mark Donahue 248 Dan Troy Drive, Williamsville, NY 14221. Please include Class of 1995 Reunionin the memo line. We plan on starting things off by participating in the Ilion Doo Dah parade Friday starting at 6 pm. We will be working on a float for this earlier in the day on a flat bed that our classmate David Brewer is providing at Jean Maneen's, 174 W. State St. After the parade there will be an informal gathering at the Ilion Elks with snacks and a cash bar. Saturday Bill Newkirk is coordinating a golf outing, for anyone interested in signing up please contact Bill at wjnewkirk1@aol.com or call him at 315-894-2196. We are looking for ideas if anyone else has something they would like to do as a group during the day on Saturday, please let us know. Saturday evening there will be dinner and dancing at Francesca's Banquet Hall, 144 E. Main St. Ilion. Cocktail hour from 6-7, Buffet dinner from 7-8, dancing with the Boss Five band from 8 - ? Sunday we will have a farewell brunch at the Maneen Pavilion at 10 AM. Retired Pastor George Rolling will do a short Ecumenical Service for us before we all say our goodbyes. Trying to keep cost of the weekend to a minimum. $30 a person should cover Fri night snacks, dinner on Sat. and brunch on Sunday, thanks to some classmates who have agreed to pitch in with a little extra cash or helping with the snacks. Please fill out the questionnaire for our updated directory, an order form for those that CAN NOT attend and would like a shirt, sweatshirt, hat or towel mailed to them. Please email forms to missjeanie@aol.com or thpeech@twcny.rr.com For letters going out in the US Mail, we are enclosing a self addressed stamped envelope to Jean Maneen, 174 W. State St., Ilion, NY 13357. If you have an email and we don't have it please send it on to us. If you are in need of accommodations, you can go online to check what is available. We have reserved a block of 10 rooms at the Herkimer Motel, 100 Marginal Road in Herkimer, NY. Tell them you are with the IHS Class of 65 and you should get a discount. I would do so as soon as possible as there are other reunions the same weekend. There are also other Motels/Hotels at Exit 31 off the Thruway. Please return as soon as possible!! Reunion Weekend Plans are made! Please share with our classmates! Sunday Aug 9 - Noon - Lunch Crossway's Tavern. Thank you Gail Smith Krueger for providing some more details about the Class of 1975 reunion. Doo Dah parade on Friday the 17th with an informal meeting at the Elks Club after the parade. Saturday - 10 am tour of high school, meet at Old Baldy. Saturday - 1 pm Erie Canal Tour for any interested. Saturday - Golf outing, contact Don Engelbrecht at nutsy1957@hotmail.com for details about golf outing. Check this site's 1974 class page for the list of those registered to date. A running list is being maintained. 1. Afternoon of Crazy Golf (drinks must be purchased in the Club House) and in the evening Hors d'oeuvres, 1 1/2 hour of open bar starting at 6 p.m. and cook your own steak dinner following for $80.00 per person. 2. Evening only with Hors d'oeuvres, 1 1/2 hour of open bar starting at 6 p.m. and cook your own steak dinner following for $60.00 per person. 6:00pm - Cocktail hour with margarita pizza, pepper sheared tuna, bruschetta, assorted cheeses and fruit. 3 hours of open bar - includes top shelf. 7:00pm - Rib eye steak (choice of chicken or fish available for those that do not eat steak but we need to know in advance if you want either chicken or fis. ), corn on the cob, salt potatoes, sald, garlic bread. RSVP with your check SOON. It's not too late. Make check payable to IHS Class of 1974. Please respond by June 15th so we can give Pine Hills a number of attendees! We will be holding our 20 year IHS Class Reunion on July 19, 2014 at Francescas Banquet Hall in Ilion. This will also be the same weekend as the Doo Dah parade. Tickets can be purchsed online at https://www.ticketriver.com/event/8698 - Please use PayPal when purchasing tickets. Knights of Columbus in Ilion. We'd love to see our siblings, friends, family, retiree's and former IHS alum join us. Cash bar, light apps & DJ Chris Conover. Fri July 19th 2013 DooDah parade (we may have a 1983 float!) then casual gatherings between Elks' Club & Knights of Columbus. Tickets: $25 per person will be available for advance sale only May 1st-July 1st. Price will include buffet dinner, coffee, tea & music, desserts donated by classmates. Cash bar. She will hold your tickets & will hand out @ the door that evening. "The Class of 2002's tenth reunion will be held the evening of Friday, November 23, 2012, from 7-10 pm, at Francesca's in Ilion. The price will be just under $30 per person and will include a variety of hors d'ouevres and open bar. People will sign up and pay through a website that we will have set up probably for the month of October." Join classmates as we gather in our hometown of Ilion, New York October 5th-7th for our 35 high school reunion. Our main focus is Saturday evening, October 6th, when we'll gather at Francesca's Banquet Hall. Our evening together includes a delicious Italian Buffet dinner, short program, gifts and recognitions, music and dancing. Cost is $35 per person. Reservations are due September 1st. Please send reservations and payment to Beth Brant, 60 Columbia Street, Mohawk, NY 13407. Write Class of 77 in the memo line - checks payable to Beth. We're also working on an informal gathering for Friday evening and a "Denny's Invasion" for Sunday brunch at Denny's in Herkimer. A block of rooms is being held at the Herkimer Motel under Ilion High School, Class of 77. Make your reservations soon to obtain the special rates being offered. Contact them at www.herkimermotel.com or 877-656-6835. Reunion Biography Booklet - Wendy Williams Mancuso is compiling a booklet for our reunion weekend. Classmates are invited to submit one 8x11 sheet (front and back if needed) with whatever information you'd like to share with classmates. You design your page with photos, contact information and your 'life story' in paragraph form. Wendy will print (in color) and bind to form a keepsake for everyone. If you can't attend the weekend, we encourage you to still submit a page. A booklet will be mailed to you after the event! Please submit in pdf format and send to Wendy at ihs77class@gmail.com Please submit all bio's by August 31st! Ann Emerson can be reached at annbythelakeshore@comcast.net or by phone 810-334-5799 (cell); 810-327-6468 (home); 810-327-6272 (work). 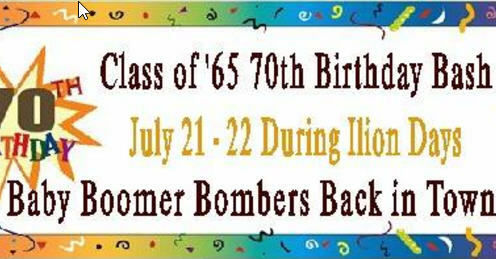 The Class of 1992 is planning a 20th Class Reunion during Ilion Days - July 2012. Saturday, July 21st at 2:00pm: Tour of IHS OR Golf Outing at Mohawk Valley Country Club. Saturday, July 21st at 7:00pm: Drinks, dinner, and dancing at Knights of Columbus. $40 for dinner - per person and includes draft beer, wine and soda. See Sendomatic.com for tickets/plans etc. See facebook - Class of 1992 for additional info. "YES, we are havin' a 50th swaree' weekend this year, and, it's pretty firm for the Ilion Days wknd., 3rd wknd. in July. We have a "committee" (of sorts) plannin' the auspicious event & now that I am aware that this great site is available to spread the news, I - or Cindy - will update all y'all on a reg'lar basis. First mtg of committee is Tues., 17th, 1 PM at Applegate's Funeral Home on West Street, -- Ya, that's what I said -- Donnie's been gracious enough to lend us some space to kick off our MAJOR EVENT planning. All local Class of '62ers are cordially invited & encouraged to attend. We'll go on & up from there."